Fascinating tales of the aswang have overshadowed the many delights Capiz has to offer its visitors. There are black sand beaches to sink your toes into, caves to explore, sleepy little hamlets to while the time away, churches that are poignant reminders of Spanish colonial rule and the freshest seafood in the islands. 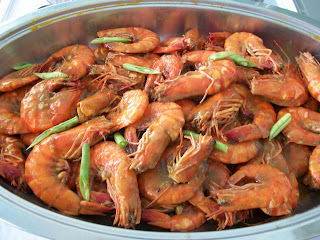 Capiz is, after all, the seafood capital of the Philippines. Baybay Beach stretches some seven kilometers along the northern Panay coastline. Restaurants on the beach afford a sweeping view of the sea and Mantalinga Island while savoring the sweet and succulent locon (prawns) or linagpang (tiny shrimp marinated in white vinegar and ginger) and boneless bangus (milkfish) off the grill. Fishermen set off for an evening at sea while others haul in their catch of the day and clean their nets on the shore in preparation for yet another day of trawling. A short drive from the capital, Roxas City, is the town of Pan-ay where the biggest bell in all of Asia is found. This bell measures 7 feet in diameter and 7 feet in height. It was cast from 70 sacks of coins donated by the local people. (Do I sense a connection here with the lucky number 7?). Eight bells of varying sizes lay silent in the Santa Monica Church belfry which may be accessed by climbing narrow and steep stairs. The view from the top is breathtaking. Green farmlands wrap the countryside as far as the eye can see. This church has withstood the elements since 1771 with its nine-foot thick walls that hark back to the Romanesque style of architecture predominant in Europe during the Middle Ages. Intricately carved hardwood retablos in the Baroque style adorn the main and side altars. Spelunking aficionados have their pick of caves in Capiz. The Suhot caves in Dumalag as the name implies, is reached by “passing under” the rock face which happens to be underwater. Spelunkers will have to swim in the cool, spring fed waters to get to the chambers on the other side. Above ground are the mouths to two shallow caverns. Before leaving the tree-lined streets of Dumalag, take time to see their parish church completed in 1872 and built from yellow sandstone capped by a blazing red dome. Note the scaled-down buttresses supporting the walls of the church. Thank goodness the word is hardly out. 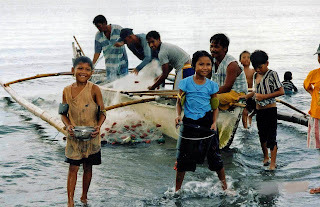 In the nearby town of Jamindan is a little known area called Kalikasan and it is inside Camp Peralta. A precipitous and often slippery hike down the mountain leads into a canyon where the forest is thick with foliage and rumors of rare wildlife abound. Waterfalls rush down the mountainside forming a refreshing pool that is quite irresistible after the challenging descent. From here you can continue your trek to the other side of the canyon. It’s best to start early before it gets unbearably hot and humid. When corporeal activities wear you down and you long to hang loose, then Dumarao is the ideal place to pass a leisurely afternoon. A profusion of bougainvilleas and gumamelas line the roadway where palay is laid to dry on a mat before it is milled. Strolling around the town plaza, one is treated to a field of colorful blooms and a charming pavilion. In the adjacent school grounds, children play raucously but they do not steal away the peaceful ambience of this clean and pleasant community. We have only skimmed through some of the many wonderful surprises Capiz has in store for its visitors. There are more to whet the appetite. And don’t worry about the notorious appetite of its mythical inhabitants. Just wear a necklace of garlic cloves and you’ll stay unscathed. Come to Capiz. It will bewitch you. This article was first published in the Manila Bulletin USA in March 2004.